Manchester United manager Jose Mourinho reportedly gave a fairly brutal response to his players in the dressing room following their shock 3-2 defeat to Brighton at the weekend. The Red Devils were well beaten in a hugely disappointing result, and it seems Mourinho was bitterly disappointed with the performance of his squad afterwards. So much so, that the Portuguese is said to have barely spoken to his team in the dressing room after the game, according to a report from the Times. Mourinho has had a difficult few weeks, with pre-season not really going to plan after some poor results in friendly matches and a lack of real strengthening in the transfer market. Fred is the only real addition to the first-team this season, with Diogo Dalot and Lee Grant looking likely to only serve as backup options at Old Trafford. 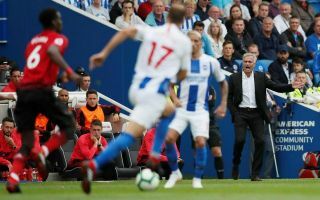 It seems clear United need more, though Mourinho’s worrying response to his players post-Brighton doesn’t look promising for the club if they are to turn things around. Still, it also seems clear this group could do more to win Mourinho over after a sloppy start to this campaign and a number of disappointing performances last year.